One of the most long-lasting and often overlooked impacts on families displaced by war may come from gaps in education. Asylum-seekers hope to resettle in new countries where unfamiliar languages are spoken, and it’s important throughout the process that refugees have access to things like language training to help them overcome bureaucratic and cultural barriers. Young children will be especially impacted by long pauses in their education, causing difficulties both before and after resettlement, and the stress of the journey to a new home is only made worse by an absence of routine and chances for learning. The educational needs of refugees has made the news. The first week at local schools was a success! These days, we’re becoming used to life at Elpida and its steady mixture of increasing stability and perpetual transitions. Day-to-day routines for most of our community members are growing as enthusiastic residents and volunteers establish classes, activities, and social groups. Each week brings new opportunities for volunteers to share their passions; we’ve had yoga, photography workshops, sewing groups, cinema, and language classes. Afternoon art activities and especially hip hop dance class have been hits with the children. Our volunteers come and go, but each transition leaves behind a step up in the sense of community and everyday comfort of our residents. We’ve upgraded our meal distribution to a fresh food market, allowing families to exercise more preference in their selection of veggies and other staples and to eat more healthily. Life in the kitchen is vibrant and our volunteers in particular are thrilled by the cross-cultural sharing of tastes. Improved structure has finally arrived during weekdays for Elpida’s children, as well. Last week was a big step for our residents and for Greece, as refugee children began afternoon courses in math, language, sports, and art at local Greek schools. Elpida’s youngsters are especially lucky to have our partners in education, ERCI, on site each day to provide additional classroom time in the mornings. Volunteers who spend much of their time playing with groups of children around the camp have already noticed the readiness and the excitement that our boys and girls feel about school. 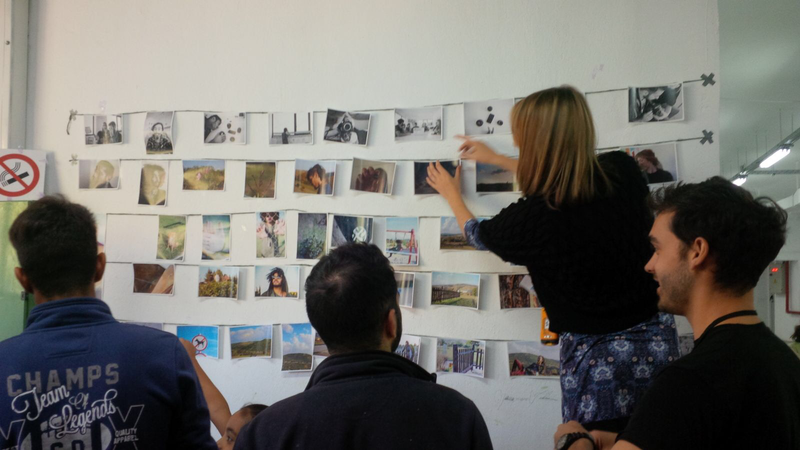 A new photography exhibit is set-up in the community space after our volunteer-led workshop. Last month, the UNHCR published a valuable report on the dire lack of education available to the nearly 6 million refugee children it supports, finding that nearly two-thirds lack the opportunity to be students. Find a New York Times summary here, or take a look at the full report. This week was the first opportunity for migrant children stranded in Greece to attend classes at local schools. It was an exciting development and a tremendous effort by the Ministry of Education. Despite some protest by a small number of local parents, most students, ours especially, experienced only a warm welcome at their school last Monday. Watch the video of Elpida kids’ arrival below! Adults and university-aged students’ situations improve with educational opportunity as well, but the loss of college access for the refugee generation could end up hampering reconstruction efforts in the Middle East, according to this analysis in the science journal Nature. Fortunately, PEER, the Platform for Education in Emergencies Response, recently established an online platform to connect students in need with scholarships and other opportunities. If you know anyone who could benefit, ask them to sign up here. Here’s a video from the local news of our Elpida students arriving at their first day of school! Let the UNHCR help you visualize the educational gap by watching this short clip. “Greek is hard to write!” A conversation with Alma, 11 years old. Were you excited to go to Greek school? What is your favorite thing to learn there? Which is more fun, English or Greek? Do you have any brothers or sisters in school? Is he in the same class? Are you and your brother pretty smart? Do you like the ERCI classes? Note: names and ages of the children above are changed to respect privacy. 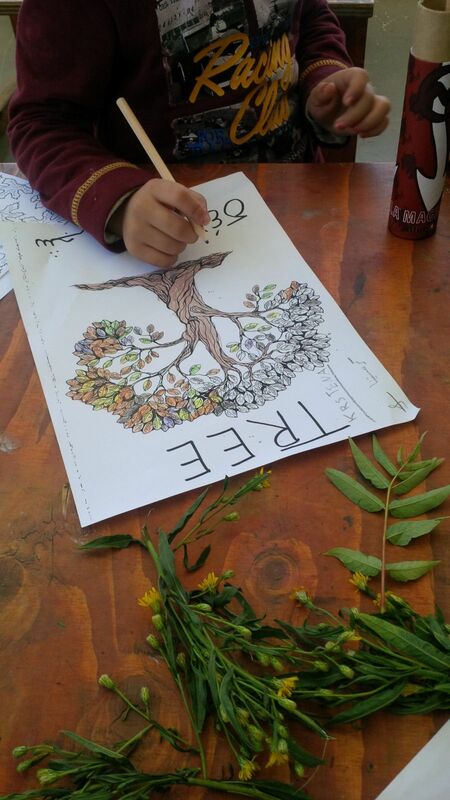 Art, nature, and language learning combine in our afternoon activities. The following is an excerpt from a longer piece that is published on our blog. Read the full story here. The trouble is that much of the time there does not seem to be all that much we can do. The days of last summer, last winter, when men and women arrived on the islands, soaked and shivering, are over for some. What many people need now is not hot tea. The original solidarity of the Europeans who welcomed the first refugees last year has stagnated as displaced people wait and wait in their camps. But here we are. And Elpida is no ordinary camp. This camp is proof, held up to Europe and the Greek government, that asylum seekers can be treated with dignity. So the children study Arabic in the morning. They attend Greek schools in the afternoons – the first refugee children in Greece to be integrated into the Greek schools. I am teaching English to adults, grown men who listen attentively as I try to guide them through the nuances of English grammar, and to teenagers, who already speak it well but want to learn more, to study at university when they finally reach the country where they will settle. And it is not all one-sided. I have been learning too, learning Arabic from a young man who was unafraid to stand up in front of a group of foreign volunteers and start explaining Arabic grammar. Despite the tension and boredom common to asylum situations, here at Elpida we are starting to build something more, a community. It is something you see in the communal kitchen where the women cook their traditional dishes with fresh food, in the sweaty t-shirts on the football courts in the afternoon, and in the classroom, where laughter and solidarity are emboldened by learning together. If you would like to donate to sustain our current efforts, follow this link. Our next newsletter will focus on successes and pitfalls in the asylum process, so stay in touch!